There is an unbreakable link between native plant species and native wildlife — native insects cannot, or will not, eat alien plants. When native plants disappear, the insects disappear, impoverishing the food source for birds and other animals. In many parts of the world, habitat destruction has been so extensive that local wildlife is in crisis and may be headed toward extinction. Bringing Nature Home has sparked a national conversation about the link between healthy local ecosystems and human well-being, and the new paperback edition — with an expanded resource section and updated photos — will help broaden the movement. Douglas W. Tallamy has written a book that will guide you through your participation to improve the patch of earth you live on. Bringing Nature Home: How You can Sustain Wildlife with Native Plants is an inexpensive book and one that should be on the shelf of all those who love wildlife and seek to have a part in protecting it. With the practical recommendations in this book, everyone can make a difference. Read more about how what you plant can kill the birds. Visit Doug's website, Bringing Nature Home, to get more information on specific plant species. You'll be amazed to see how many species some of them help out. 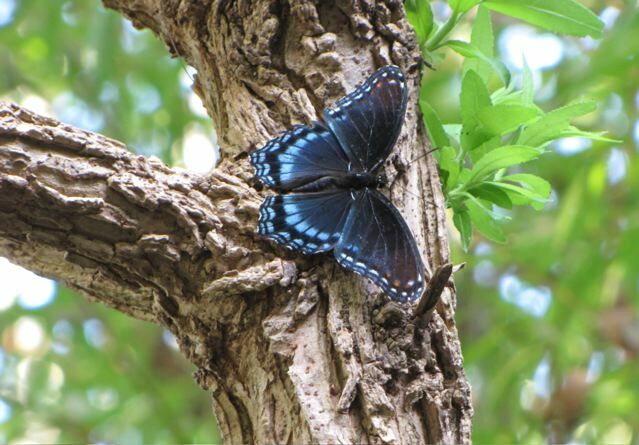 Like oak trees support 534 butterfly and moth species and their larvae is necessary for birds to feed their young. Willow trees are good for 455 species. Blueberry bushes support 368 and can be grown in pots on a porch or deck. We're blessed to have a bunch of wild blueberry bushes around the edges of our woods. Goldenrods support 115 species with asters supporting 112. Goldenrods attract many beneficial insects. I've noticed that goldenrods are now being sold in garden centers. Many people used to think they were responsible for allergies, but goldenrod is not wind pollinated. There are many treasures found in having Goldenrod. Hornworms which are often found on tomatoes and other members of the nightshade family turn into beautiful Hummingbird Moths in their adult form. Educating ourselves on the many wonders of nature around us can be all the entertainment we need. It certainly is more brain-stimulating than staring at a tube.